In this manner it was that Roman republicanism ended in a princeps or ruling prince, and the first great experiment in a self-governing community on a scale larger than that of tribe or city, collapsed and failed. The essence of its failure was that it could not sustain unity. In its early stages its citizens, both patrician and plebeian, had a certain tradition of justice and good faith, and of the loyalty of all citizens to the law, and of the goodness of the law for all citizens; it clung to this idea of the importance of the law and of law-abidingness nearly into the first century B.C. But the unforeseen invention and development of money, the temptations and disruptions of imperial expansion, the entanglement of electoral methods, weakened and swamped this tradition by presenting old issues in new disguises under which the judgment did not recognize them, and by enabling men to be loyal to the professions of citizenship and disloyal to its spirit. The bond of the Roman people had always been a moral rather than a religious bond; their religion was sacrificial and superstitious; it embodied no such great ideas of a divine leader and of a sacred mission as Judaism was developing. As the idea of citizenship failed and faded before the new occasions, there remained no inner, that is to say no real, unity in the system at all. Every man tended more and more to do what was right in his own eyes. Under such conditions there was no choice between chaos and a return to monarchy, to the acceptance of some chosen individual as the one unifying will in the state. Of course in that return there is always hidden the expectation that the monarch will become as it were magic, will cease to be merely a petty human being, and will think and feel as something greater and more noble, as indeed a state personage; and of course monarchy invariably fails to satisfy that expectation. We shall glance at the extent of this failure in the brief review we shall presently make of the emperors of Rome. We shall find at last one of the more constructive of these emperors, Constantine the Great, conscious of his own inadequacy as a unifying power, turning to the faith, the organization, and teaching network of one of the new religious movements in the empire, to supply just that permeating and correlating factor in men’s minds that was so manifestly wanting. 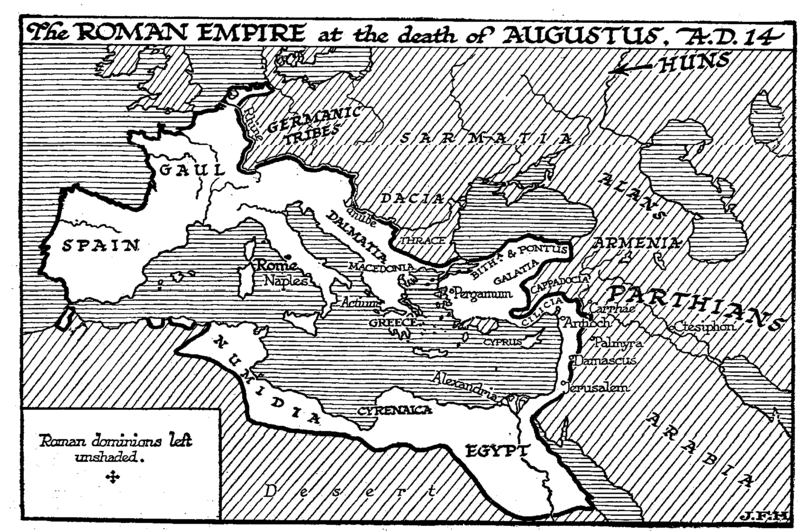 With Caesar, the civilization of Europe and Western Asia went back to monarchy, and, through monarchy, assisted presently by organized Christianity, it sought to achieve peace, righteousness, happiness, and world order for close upon eighteen centuries. Then almost suddenly it began reverting to republicanism, first in one country and then in another, and, assisted by the new powers of printing and the press and of organized general education, and by the universalist religious ideas in which the world had been soaked for generations, it seems now to have resumed again the effort to create a republican world-state and a world-wide scheme of economic righteousness which the Romans had made so prematurely and in which they had so utterly and disastrously failed. Certain conditions, we are new beginning to perceive, are absolutely necessary to such a creation; conditions which it is inconceivable that any pre-Christian Roman could have regarded as possible. We may still think the attainment of these conditions a vastly laborious and difficult and uncertain undertaking, but we understand that the attempt must be made because no other prospect before us gives even a promise of happiness or self-respect or preservation of our kind. The first of these conditions is that there should be a common political idea in the minds of all men, an idea of the state thought of as the personal possession of each individual and as the backbone fact of his scheme of duties. In the early days of Rome, when it was a little visible state, twenty miles square, such notions could be and were developed in children in their homes, and by what they saw and heard of the political lives of their fathers; but in a larger country such as Rome had already become before the war with Pyrrhus, there was a need of an organized teaching of the history, of the main laws, and of the general intentions, of the state towards everyone if this moral unity was to be maintained. But the need was never realized, and no attempt at, any such teaching was ever made. At the time it could not have been made. It is inconceivable that it could have been made. The knowledge was not there, and there existed no class from which the needed teachers could be drawn and no conception of an organization for any such systematic moral and intellectual training as the teaching organization of Christianity, with its creeds and catechisms and sermons and confirmations, presently supplied. Moreover, we know nowadays that even a universal education of this sort supplies only the basis for a healthy republican state. Next to education there must come abundant, prompt, and truthful information of what is going on in the state, and frank and free discussion of the issues of the time. Even nowadays these functions are performed only very imperfectly and badly by the press we have and by our publicists and politicians; but badly though it is done, the thing is done, and the fact that it is done at all argues that it may ultimately be done well. In the Roman state it was not even attempted. The Roman citizen got his political facts from rumour and the occasional orator. He stood wedged in the forum, imperfectly hearing a distant speaker. He probably misconceived every issue upon which he voted. And of the monstrous ineffectiveness of the Roman voting system we have already written. Unable to surmount or remove these obstacles to a sane and effective popular government, the political instincts of the Roman mind turned towards monarchy. But it was not monarchy of the later European type, not hereditary monarchy, which was now installed in Rome. The princeps was really like an American war-time president, but he was elected not for four years but for life, he was able to appoint senators instead of being restrained by an elected senate, and with a rabble popular meeting in the place of the house of representatives. He was also pontifex maximus, chief of the sacrificial priests, a function unknown at Washington; and in practice it became usual for him to designate and train his successor and to select for that honour a son or an adopted son or a near relation whom he could trust. The power of the princeps was in itself enormous to entrust to the hands of a single man without any adequate checks, but it was further enhanced by the tradition of monarch-worship which had now spread out from Egypt over the entire Hellenized east, and which was coming to Rome in the head of every Oriental slave and immigrant. By natural and imperceptible degrees the idea of the god-emperor came to dominate the whole Romanized world. Only one thing presently remained to remind the god-emperor that he was mortal, and that was the army. The god-emperor was never safe upon the Olympus of the Palatine Hill at Rome. He was only secure while he was the beloved captain of his legions. And as a consequence only the hardworking emperors who kept their legions active and in close touch with themselves had long reigns. The sword overhung the emperor and spurred him to incessant activity. If he left things to his generals, one of those generals presently replaced him. This spur was perhaps the redeeming feature of the Roman Imperial system. In the greater, compacter, and securer empire of China there was not the same need of legions, and so there was-not the same swift end for lazy or dissipated or juvenile monarchs that overtook such types in Rome.